Upon exposure to Ag and inflammatory stimuli, dendritic cells (DCs) undergo a series of dynamic cellular events, referred to as DC maturation, that involve facilitated peptide Ag loading onto MHC class II molecules and their subsequent transport to the cell surface. Besides MHC molecules, human DCs prominently express molecules of the CD1 family (CD1a, -b, -c, and -d) and mediate CD1-dependent presentation of lipid and glycolipid Ags to T cells, but the impact of DC maturation upon CD1 trafficking and Ag presentation is unknown. Using monocyte-derived immature DCs and those stimulated with TNF-α for maturation, we observed that none of the CD1 isoforms underwent changes in intracellular trafficking that mimicked MHC class II molecules during DC maturation. In contrast to the striking increase in surface expression of MHC class II on mature DCs, the surface expression of CD1 molecules was either increased only slightly (for CD1b and CD1c) or decreased (for CD1a). In addition, unlike MHC class II, DC maturation-associated transport from lysosomes to the plasma membrane was not readily detected for CD1b despite the fact that both molecules were prominently expressed in the same MIIC lysosomal compartments before maturation. Consistent with this, DCs efficiently presented CD1b-restricted lipid Ags to specific T cells similarly in immature and mature DCs. Thus, DC maturation-independent pathways for lipid Ag presentation by CD1 may play a crucial role in host defense, even before DCs are able to induce maximum activation of peptide Ag-specific T cells. Dendritic cells (DCs)3 capture Ags in peripheral tissues and then migrate to lymphoid organs, where they are critical in presenting processed Ags to stimulate naive T cells. In this pathway DCs undergo a coordinate series of changes, resulting in maximum activation of peptide Ag-specific T cells (1). For MHC class II molecules, newly synthesized α and β subunits are translocated into the endoplasmic reticulum, where they associate with the invariant chain (2). After transport to the trans-Golgi network, these αβ:invariant chain complexes are mainly sorted to endocytic pathways directly or transported to the cell surface and then internalized to the endocytic compartments, ultimately localizing to a specialized lysosomal compartment called the MHC class II compartment (MIIC) (3). In DCs exposed to Ag and maturational stimuli, such as LPS and TNF-α, peptide loading is thought to occur in the MIIC, followed by transport of Ag-bound MHC class II molecules to the cell surface (4, 5, 6, 7). Concurrently, endocytosis is down-regulated, resulting in the accumulation of MHC class II/peptide complexes on the cell surface (8, 9). These DC maturation-associated changes in MHC class II trafficking are critical for peptide Ag presentation. CD1 molecules constitute a separate lineage of MHC-like molecules that function to bind and present lipid Ags to T cells (10, 11). Human CD1a, -b, -c, and -d are predominantly expressed on professional APCs such as DC and B cells. The CD1a, -b, -c, and -d isoforms have been shown to traffic and localize in distinct subcompartments of the endocytic system. Following assembly with β2-microglobulin in the endoplasmic reticulum, CD1b heavy chains are transported to the cell surface and then internalized via specific interaction of their cytoplasmic tail tyrosine-based sequence with the AP-2 clathrin coat-associated adaptor protein complex (12, 13, 14). Subsequently, CD1b molecules are further transported deeply into the endocytic system and reach lysosomes, including the MIIC, as a result of selective binding of the AP-3 complex that is known to interact with certain lysosome-resident proteins, such as lysosome-associated membrane protein-1 (lamp-1) (15). CD1c and CD1d also contain similar cytoplasmic tail tyrosine-based sorting motifs, but their failure to bind the AP-3 complex results in their substantial distribution to the early endocytic system, although a fraction of them can reach lysosomes through an undefined pathway (15, 16, 17). Unlike other CD1 molecules, CD1a lacks the cytoplasmic tail tyrosine-based sorting sequence, and, within the endocytic system, is expressed solely in early endosomes of the recycling pathway (18). Together, these observations underscore the capacity of CD1 to broadly survey the endocytic system for sampling lipid Ags that may localize in various endocytic subcompartments (19). These studies, however, only determined the intracellular trafficking and localization of CD1 molecules in immature DCs as well as non-DC lineages of cells transfected with CD1. The distinct intracellular trafficking of CD1 and the distinct chemical nature of Ags presented by CD1 as well as the different subsets of T cells they activate raised the possibility that the CD1 and MHC trafficking and function might be differentially controlled during DC maturation. In the present study using monocyte-derived immature DCs and those stimulated with TNF-α for maturation, we found that none of the CD1 isoforms was up-regulated on the cell surface after DC maturation to levels comparable to those of MHC class II. Whereas immature DCs contained a large pool of MHC class II and CD1b molecules, both localized in lysosomes, the lysosomes of mature DCs were almost devoid of MHC class II, but still contained the majority of the CD1b molecules. This suggests that unlike MHC class II, CD1b molecules continue to survey lysosomes in a manner that may not be dramatically altered upon DC maturation. Further, CD1b-mediated presentation of lipid Ags occurred efficiently even without maturational stimuli. These studies detecting the differential pathways for Ag presentation by CD1 and MHC molecules during DC maturation support the concept that CD1-based Ag presentation may occur earlier in the immune response than MHC class II-based Ag presentation. The tissue culture medium used throughout this study was RPMI 1640 complete medium (20 mM HEPES, 2 mM l-glutamine, 1 mM sodium pyruvate, 100 μg/ml penicillin-streptomycin, 55 μM 2-ME (all from Life Technologies, Gaithersburg, MD), and 10% heat-inactivated FCS (HyClone, Logan, UT)). To generate immature DCs, human peripheral blood monocytes were isolated as described previously (20) and cultured in RPMI 1640 complete medium containing 300 U/ml rGM-CSF (Immunex, Seattle, WA) and 200 U/ml rIL-4 (PeproTech, Rocky Hill, NJ) for 3 days. For induction of DC maturation the cells were stimulated with either 50 ng/ml TNF-α (Pierce, Rockford, IL) or 1 μg/ml LPS (Sigma, St. Louis, MO) for an additional 1 or 2 days in the presence of the same concentrations of GM-CSF and IL-4. The glucose monomycolate (GMM)-specific, CD1b-restricted T cell line, LDN5 (21), and the tetanus toxoid (TT)-specific, HLA-DR-restricted T cell line, SPF3 (22), were cultured as previously described. Flow cytometry was performed as previously described (23), using the following mAbs: P3 (control) (23), W6/32 (anti-MHC class I) (24), L243 (anti-HLA-DR) (25), 10H3.9.3 (anti-CD1a) (26), BCD1b3.1 (anti-CD1b) (27), F10/21A3.1 (anti-CD1c) (28), CD1d42.1.1 (anti-CD1d) (29), anti-CD83 (Ancell, Bayport, MN), anti-CD86, and anti-CD14 (both from BD PharMingen, San Diego, CA). These mouse Abs were followed by FITC-conjugated goat F(ab′)2 Abs against mouse IgG and IgM (BioSource International, Camarillo, CA). For double staining, cells were double labeled with FITC-conjugated mouse mAbs against MHC class II (Ancell), CD1a (BD PharMingen), CD1b (BD PharMingen), and CD1c (Ancell) and PE-conjugated mouse mAbs against CD83 (BD PharMingen). The endocytic capacity of DCs was examined as previously described (5). Briefly, GM-CSF/IL-4-stimulated immature DCs and TNF-α-treated mature DCs (5 × 105/ml) were incubated with 1 mg/ml of FITC-conjugated dextran (Sigma) in RPMI complete medium at 37°C for the indicated periods of time. At each time point, the cells were quickly chilled and washed three times in cold PBS containing 1% FCS. The accumulation of FITC-conjugated dextran within the cells was measured by flow cytometry. DCs were adhered on glass slides by a cytospin procedure and labeled with anti-CD83 Ab, followed by incubation with Texas Red-conjugated donkey F(ab′)2 anti-mouse IgG (Jackson ImmunoResearch Laboratories, West Grove, PA). The incubation was performed on ice for 30 min. The cells were then fixed with 2% formaldehyde in PBS for 10 min at room temperature, permeabilized with 0.2% saponin, and double labeled with either FITC-conjugate anti-HLA-DR (LB3.1) (30) or Alexa488-conjugated anti-CD1b (BCD1b3.1). For detection of CD1a and CD1c, biotinylated Abs (10H3.9.3 and F10/21A3.1, respectively) were used, followed by incubation with FITC-conjugated streptavidin. For colocalization studies with lamp-1, DCs were first fixed and permeabilized as described above, and double labeling with rabbit anti-lamp-1 (31) and LB3.1, 10H3.9.3, BCD1b3.1 or F10/21A3.1 was performed, followed by incubation with Texas Red-conjugated donkey anti-rabbit IgG and FITC-conjugated donkey anti-mouse IgG (both from Jackson ImmunoResearch Laboratories). The labeled cells were examined using a Leica TCS-NT confocal laser scanning microscope (Deerfield, IL) fitted with krypton and argon lasers as previously described (32). CD83− immature DCs were prepared, using GM-CSF/IL-4-stimulated monocytes and anti-CD83-coupled magnetic beads for depletion. The CD83− cells were pulsed with TT (for SPF3) or with purified long chain (C80) GMM (for LDN5) for 10 min at 37°C. The cells were then chilled on ice, washed three times with cold PBS, and resuspended in RPMI 1640 complete medium supplemented with GM-CSF and IL-4 either with or without 50 ng/ml of TNF-α. After 24 h, DCs (5 × 104/well) were fixed with 0.04% glutaraldehyde and incubated with either SPF3 or LDN5 (1 × 105/well) for 3 days. T cell proliferation was assessed by measuring the uptake of [3H]thymidine (1 μCi/well) for the last 6 h of culture. Monocytes grown in GM-CSF/IL-4-containing medium either with or without TNF-α were fixed using 2% paraformaldehyde and 0.2% glutaraldehyde, and processed for cryosectioning as previously described (33). Ultrathin sections were cut at −120°C and immunogold labeled at room temperature using mouse anti-CD1b Ab (BCD1b2.1) (27) and rabbit anti-MHC class II Ab (34). Bound anti-CD1b Ab was detected using rabbit antiserum against mouse IgG (DAKO, Glostrup, Denmark) and protein A conjugated to 15 nm gold (EM Laboratory, Utrecht University, The Netherlands), whereas bound anti-MHC class II Ab was directly detected using protein A conjugated to 10 nm gold. Immunogold-labeled sections were viewed using a CM10 transmission electron microscope (Philips Electronic Instruments, Mahway, NJ). To study Ag presentation by CD1 and MHC class II during DC maturation we first established an in vitro method to drive DC maturation. Human peripheral blood monocytes were cultured in the presence of GM-CSF and IL-4 for 3 days to induce their differentiation into immature DCs. The cells were then stimulated to mature by incubation for an additional 2 days with TNF-α in the continued presence of GM-CSF and IL-4. During the first 3 days of culture in GM-CSF and IL-4, most cells developed fine projections and lost adherence to the surface of tissue culture plates. These cells acquired an even more dendritic appearance after an additional 2-day stimulation with TNF-α (data not shown). This morphological alteration was associated with phenotypic changes as determined by flow cytometry (Fig. 1⇓A). Fresh monocytes (Fig. 1⇓A, upper panels, day 0) prominently expressed MHC class I and class II molecules as well as CD86 and CD14, but almost completely lacked the expression of CD1a, -b, and -c molecules. After exposure to GM-CSF and IL-4 for 5 days without TNF-α (day 5, −TNF-α), the surface expression of CD1a, -b, and -c molecules was markedly induced (Fig. 1⇓A, middle panels). Consistent with an immature DC phenotype, a majority of these cells lacked expression of CD83, a marker of mature DCs (35). In contrast, when monocytes were incubated with GM-CSF and IL-4 for the first 3 days and then further stimulated with TNF-α in the continued presence of GM-CSF and IL-4 for an additional 2 days (day 5, +TNF-α), marked changes associated with DC maturation were observed. The TNF-α-stimulated DCs prominently expressed CD83 as well as high levels of MHC class II and CD86 and largely lost the expression of CD14. Furthermore, as shown in Fig. 2⇓, the endocytic activity of TNF-α-treated DCs (+TNF-α/37°C), assessed by uptake of extracellular FITC-conjugated dextran, was significantly reduced compared with that of DCs that were not exposed to TNF-α (−TNF-α/37°C). Together, these phenotypic and functional analyses confirmed that the cells obtained after stimulation of monocyte-derived immature DCs with TNF-α were mature DCs. These immature and mature DCs were used in the present study, addressing the impact of DC maturation on CD1 and MHC class II-dependent Ag presentation. Flow cytometric analysis of fresh monocytes and monocyte-derived immature and mature DCs. A, Fresh monocytes (day 0) were cultured with GM-CSF and IL-4 for 3 days to develop into immature DCs. These DCs were then cultured in the presence of GM-CSF and IL-4 for an additional 2 days either with or without TNF-α to generate mature DCs (day 5 (+TNF-α)) or to maintain the immature phenotype (day 5 (−TNF-α)). The surface phenotype of fresh monocytes, immature DCs, and mature DCs were examined by flow cytometry with the indicated Abs. B, CD83+ and CD83− DCs were separately analyzed by double labeling to more clearly appreciate the changes in surface expression of MHC class II, CD1a, -b, -c, and -d molecules during DC maturation. The horizontal line in each panel separates the CD83+ cells (above the line) from CD83− cells (below the line). CD83− cells comprised ∼89% of the total cell population without TNF-α treatment (upper panels, day 5 (−TNF-α)). The MFI values for MHC class II, CD1a, -b, -c, and -d in the CD83− cell population were 481, 437, 62, 111, and 5, respectively. After TNF-α treatment (lower panels, day 5 (+TNF-α)), ∼80% of the cells expressed CD83. The MFI values for MHC class II, CD1a, -b, -c, and -d in these CD83+ cell populations were 2577, 221, 157, 192, and 9, respectively. C, A ratio of the MFI of mature DCs after TNF-α stimulation to that of immature DCs before TNF-α stimulation was calculated for each molecule in 11 independent experiments and plotted. The bar in each panel indicates the mean value. High endocytic activity by immature, but not, mature DCs. TNF-α treated (○ and •) and untreated (□ and ▪) DCs were incubated with FITC-conjugated dextran for the indicated periods of time at 37°C (○ and □) or 0°C (• and ▪). 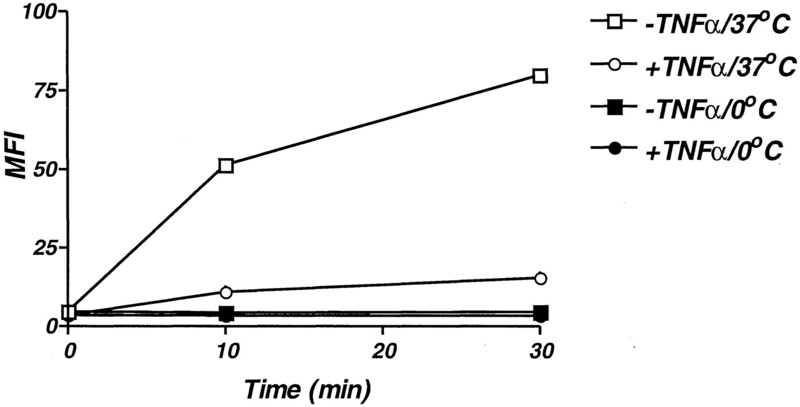 At each of the indicated time points, the cells were chilled on ice and washed, and the uptake of FITC-conjugated dextran was assessed by flow cytometry. In contrast to MHC class II, whose surface expression on DCs was prominently up-regulated upon TNF-α stimulation, changes in surface expression levels of CD1a, -b, and -c molecules were not as apparent (Fig. 1⇑A, compare day 5, −TNF-α with day 5, +TNF-α). We considered the possibility that TNF-α-stimulated DCs might be heterogeneous in the degree of maturation. Indeed, a small, but significant, fraction of TNF-α-stimulated DCs remained negative for CD83 (Fig. 1⇑A) and thus were not mature DCs. Conversely, a small fraction of TNF-α-unstimulated DCs expressed low levels of CD83 (Fig. 1⇑A). To better analyze the surface expression of CD1 molecules on immature DCs and mature DCs in these heterogeneous cultures, we performed double labeling with mAbs to CD83 (PE) and either MHC class II or CD1 molecules (FITC), and the major DC subpopulations in each culture, namely CD83-negative DCs without TNF-α stimulation and CD83-positive DCs after TNF-α stimulation, were compared for MHC class II and CD1 expression (Fig. 1⇑B). As expected, the surface levels of MHC class II increased markedly after TNF-α stimulation on CD83+ DC (mean fluorescence intensity (MFI) of 481 on CD83− DC before TNF-α stimulation to MFI of 2577 on CD83+ DC after TNF-α stimulation). In contrast to the striking increase in surface expression of MHC class II, the cell surface expression of CD1 molecules was either increased only slightly (for CD1b and CD1c) or decreased (for CD1a). In the representative experiment depicted in Fig. 1⇑B, the surface expression of CD1b was increased with MFI from 62 (on CD83− DC without TNF-α stimulation) to 158 (on CD83+ DC after TNF-α stimulation), and CD1c expression was increased with MFI from 110 to 192, whereas the surface expression of CD1a decreased from MFI 436 to 221. The level of CD1d surface expression remained essentially unchanged. To illustrate the changes in surface expression of Ag-presenting molecules during DC maturation, we calculated a ratio of MFI of mature DCs (CD83-positive population) to that of immature DCs (CD83-negative population) for each Ag-presenting molecule in 11 independent experiments and plotted the results (Fig. 1⇑C). After TNF-α stimulation, surface expression of CD1a was decreased by half, whereas that of CD1b and CD1c was increased ∼1- to 3-fold. These small increases contrasted the larger up to 5-fold increase in the surface expression of MHC class II molecules (Fig. 1⇑C). These results suggested that trafficking of CD1 and MHC class II molecules might be controlled differently during DC maturation. We applied confocal immunofluorescence microscopy to study the intracellular distribution of CD1 and MHC class II molecules during DC maturation. To distinguish mature DCs from a small faction of immature DCs that might be present even after TNF-α stimulation, cells were labeled first with anti-CD83 mAb before permeabilization and then permeabilized for detection of intracellular CD1 and MHC class II molecules. The monocyte-derived immature DCs lacked the expression of CD83 and contained a pool of intracellular MHC class II molecules in peripherally distributed vesicles that corresponded to the MIIC (Fig. 3⇓A, top panels, indicated with arrowheads). After TNF-α stimulation, most cells gained expression of CD83 on the cell surface and displayed a striking shift of MHC class II from the intracellular pool to the plasma membrane (tailed arrow), whereas a small fraction of cells that did not express CD83 still contained intracellular vesicles expressing MHC class II (Fig. 3⇓A, middle panels, arrowhead). The redistribution of MHC class II to the plasma membrane in TNF-α-stimulated DCs was comparable to that seen in LPS-stimulated DCs (Fig. 3⇓A, bottom panels). Intracellular localization of MHC class II and CD1 molecules before and after TNF-α or LPS stimulation. Immature DC and those stimulated for 2 days with TNF-α or LPS for maturation were labeled on ice with anti-CD83 Ab, followed by incubation with Texas Red-conjugated donkey anti-mouse IgG Abs. The cells were then fixed with 2% formaldehyde, permeabilized in 0.2% saponin, and double labeled with FITC-conjugated LB3.1 mAb to MHC class II (A). Note that MHC class II molecules were intracellularly localized before TNF-α or LPS treatment (arrowhead, upper panel) and up-regulated to the cell surface after the treatment (solid-tailed arrow, middle and lower panels). The maturation marker CD83 similarly moved from an intracellular location (not seen, as cells were stained with anti-CD83 mAb before permeabilization) to the cell surface (stained positive before permeabilization) after maturation. B, As above, except DCs were stained with Alexa488-conjugated BCD1b3.1 Ab to CD1b. Note that CD1b molecules were found mostly intracellularly, but in diffusely distributed punctate vesicles in immature DCs (arrowhead, upper panel) and in a clustered compartment in mature DCs (solid-tailed arrow, lower panel). C, As above, except DCs were stained with biotinylated 10H3.9.3 mAb to CD1a, followed by FITC-conjugated streptavidin. Note that CD1a expression predominated at the cell surface in immature DCs (arrowhead, upper panel), decreased at the surface in mature DCs (arrowhead, lower panel), and appeared in clustered intracellular compartment (solid-tailed arrow, lower panel). D, As above, except DCs were stained with biotinylated F10/21A3.1 mAb to CD1c, followed by FITC-conjugated streptavidin. Note that changes inCD1c localization before and after TNF-α treatment were not apparent (arrowhead and solid-tailed arrow, both panels). Single-stained images for MHC class II and CD1a, -b, and -c are in green, and single-stained image for CD83 is in red. The third image in each horizontal panel set represents the merge of the first (green) and second (red) images. Scale bars = 5 μm. To determine whether similar changes occurred for CD1 molecules during DC maturation, CD1 expression in immature and mature DCs was determined by confocal microscopy. In immature DCs, we previously demonstrated that CD1b and MHC class II molecules localized to the MIIC lysosomal compartment (13). Thus, like MHC class II (Fig. 3⇑A, upper panels), CD1b was prominent in peripherally distributed vesicles (Fig. 3⇑B, upper panels, arrowheads). After TNF-α stimulation, however, little shift from lysosomes to the plasma membrane occurred for CD1b compared with that which occurred for MHC class II (Fig. 3⇑B, lower panels). Instead, CD1b-containing vesicles remained intracellularly and appeared clustered (Fig. 3⇑B, lower panels, arrows). These results underscored the possibility that CD1b and MHC class II resided in the same lysosomes in immature DCs, but might follow distinct intracellular pathways during DC maturation, as discussed in more detail below. Unlike CD1b, CD1a molecules are prominently expressed on the surface of immature DCs, with a small fraction localized to early recycling endosomes (18). Thus, labeling of immature DCs with anti-CD1a mAb revealed strong cell surface staining (arrowhead) as well as a few CD1a+ intracellular vesicles (Fig. 3⇑C, upper panels). After TNF-α stimulation, the surface CD1a staining became appreciably less bright, and the proportion of intracellular CD1a (arrow) to surface CD1a (arrowhead) was increased (Fig. 3⇑C, lower panels). Thus, consistent with the flow cytometric results presented in Fig. 1⇑C, the surface expression of CD1a was down-regulated upon DC maturation. Labeling of immature DCs with anti-CD1c mAb revealed its expression both on the cell surface (Fig. 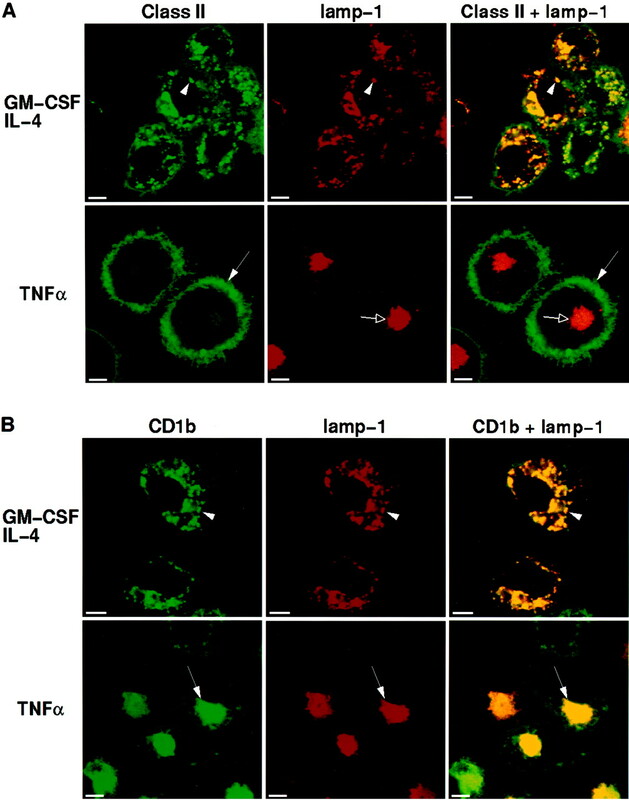 3⇑D, upper panels, arrow) and in intracellular vesicles (arrowheads), and its cellular localization was not noticeably altered after TNF-α stimulation (Fig. 3⇑D, lower panels). Thus, the flow cytometric and confocal immunofluorescence microscopic studies suggested that CD1a, -b, and -c molecules trafficked separately from MHC class II during DC maturation. Both CD1b and MHC class II molecules are expressed prominently in the same lysosomal compartments in immature DCs. As demonstrated above, however, striking alterations in intracellular localization were detected for both molecules after TNF-α stimulation. Whereas most MHC class II molecules redistributed to the plasma membrane after TNF-α stimulation, a majority of CD1b molecules remained in intracellular vesicles. To gain further insight into pathways for their intracellular transport during DC maturation, localization of CD1b and MHC class II molecules by confocal fluorescence microscopy was compared with that of lamp-1, a marker protein for late endosomes and lysosomes. Immature and mature DCs were double labeled with Abs to lamp-1 and either CD1 or MHC class II molecules. As expected from the results presented above, MHC class II molecules were expressed prominently in peripherally distributed vesicles containing lamp-1 in immature DCs (Fig. 4⇓A, upper panels, arrowheads). After TNF-α stimulation, the majority of MHC class II molecules trafficked out of the lysosomes and reached the plasma membrane (Fig. 4⇓A, lower panels, solid-tailed arrows), while lamp-1+ lysosomes became clustered mainly at the perinuclear region (open-tailed arrows). 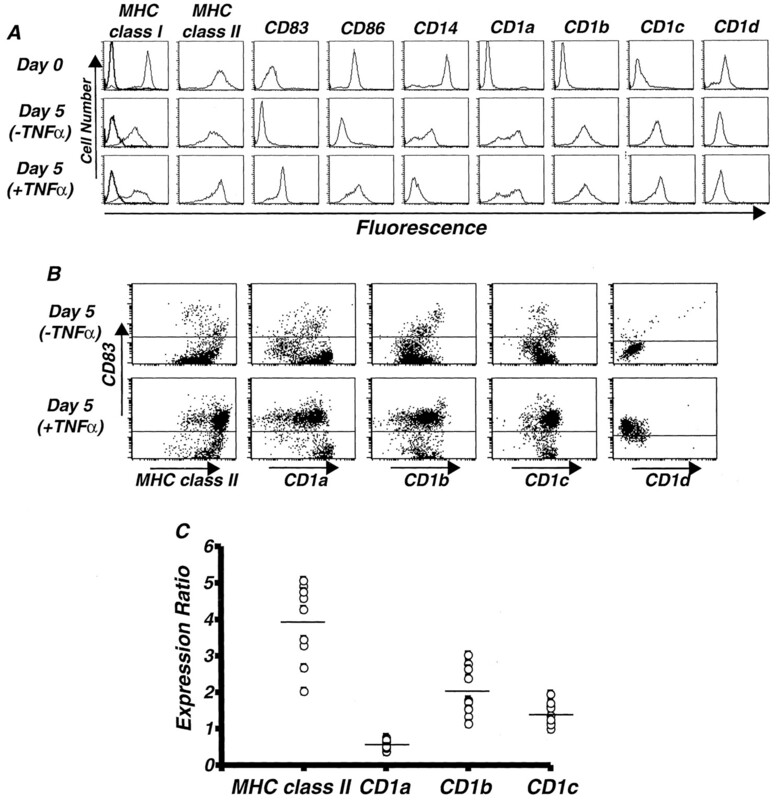 Colocalization of MHC class II and CD1 molecules with lamp-1. 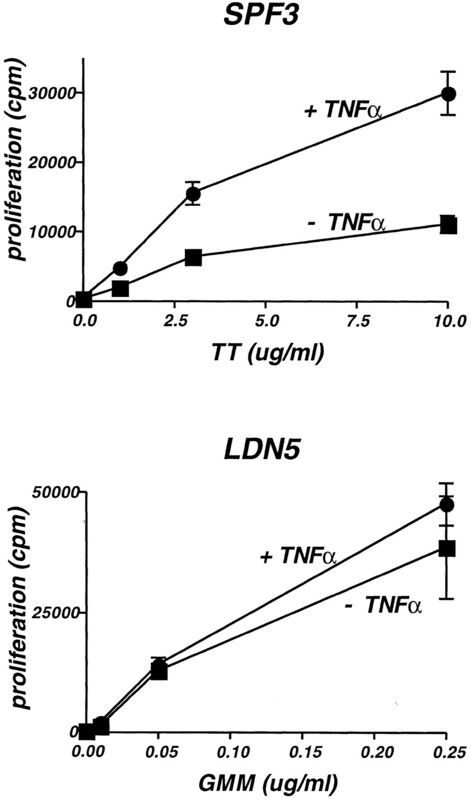 TNF-α-stimulated and unstimulated DCs were fixed and permeabilized. Subsequently, the cells were labeled with rabbit Abs to lamp-1 (detected with Texas Red-conjugated Abs to rabbit IgG) and double labeled with the following Abs (detected with FITC-conjugated anti-mouse IgG Ab). A, Anti-MHC class II mAb. Single-stained images for MHC class II are in green, and single-stained images for lamp-1 are in red. The third image in each horizontal panel set represents the merge of the first (green) and second (red) images. Scale bars = 5 μM. MHC class II redistributed from the intracellular lamp-1-positive compartment (arrowhead, upper panel) to the cell surface (solid-tailed arrow, lower panel). The lamp-1-positive compartment became clustered after TNF-α stimulation (open-tailed arrow, lower panel). B, Anti-CD1b mAb. CD1b colocalized with lamp-1 in immature DCs (arrowhead, upper panel) and remained colocalized with lamp-1 structures that became clustered intracellularly (solid-tailed arrow, lower panel). CD1b was also expressed in lamp-1+ lysosomes in immature DCs (Fig. 4⇑B, upper panels, arrowheads), but unlike MHC class II, only a marginal increase in surface expression was observed for CD1b after TNF-α stimulation. Instead, a majority of CD1b molecules remained intracellularly and were expressed in a large cluster of vesicles at the perinuclear region (Fig. 4⇑B, lower panels, tailed arrows). These CD1b-containing vesicles were most likely lysosomes, since a similar distribution was observed for lamp-1, but because of their highly clustered distribution of these vesicles it was difficult to determine their identity at this level of resolution. To overcome this problem, we conducted immunogold-labeled transmission electron microscopy. In immature DCs both MHC class II (small gold particles, indicated with small arrows) and CD1b molecules (large gold particles, indicated with large arrowheads) were expressed in electron-dense multilamellar compartments, confirming their prominent localization in lysosomes (Fig. 5⇓A). 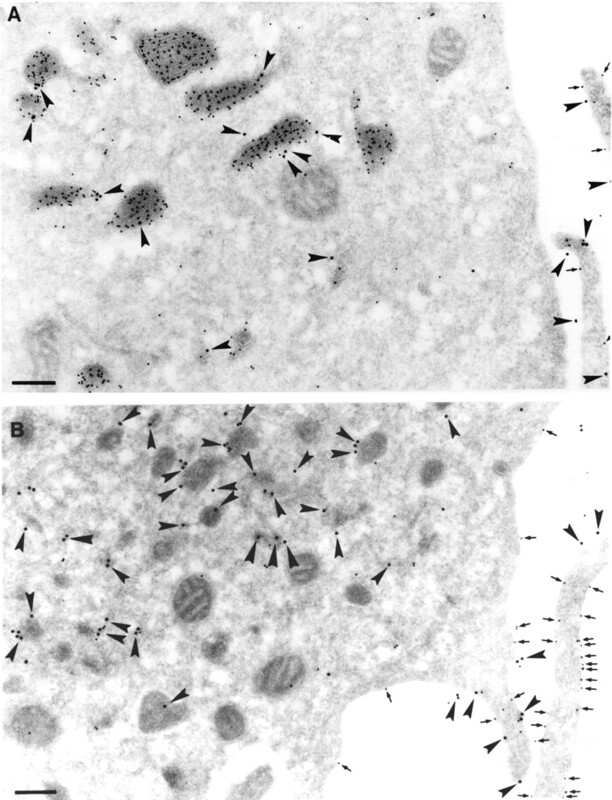 After 48-h maturation with TNF-α, the electron-dense lysosomes appeared smaller in diameter, but remained as separate compartments (Fig. 5⇓B). These lysosomal compartments still contained CD1b molecules (large gold particles indicated with large arrowheads) and lamp-1 (not shown), while MHC class II molecules largely redistributed from the lysosomes to the plasma membrane (small arrows). These observations suggested that lysosomes underwent dynamic changes during DC maturation in their morphology, their localization, and possibly their function, resulting in a redistribution to the plasma membrane only of MHC class II and not a majority of CD1b molecules. Immunoelectron micrographs of thin cryosections of immature and mature DCs. Immature DCs (A) and TNF-α-treated mature (B) DCs were analyzed for expression of CD1b (15-nm gold particles, large arrowheads) and MHC class II (10-nm gold particles, small arrows). Scale bar = 200 nm. Note that the abundant localization of MHC II labeling in the multilamellar lysosomes of immature DC is lost in electron-dense unilamellar lysosomes of matured DC, where it appears on the plasma membrane. In contrast, CD1b labeling is preserved in the immature and altered lysosomes of mature DC as well as on the cell surface. It has been established that remarkable transport of Ag-loaded MHC class II molecules from lysosomes to the cell surface occurs during DC maturation, resulting in efficient activation of Ag-specific T cells (1). Given the substantial difference, detected above, between MHC class II and CD1b molecules in their net transport from lysosomes to the cell surface during DC maturation, we reasoned that, unlike MHC class II, CD1b might function independently of DC maturation. 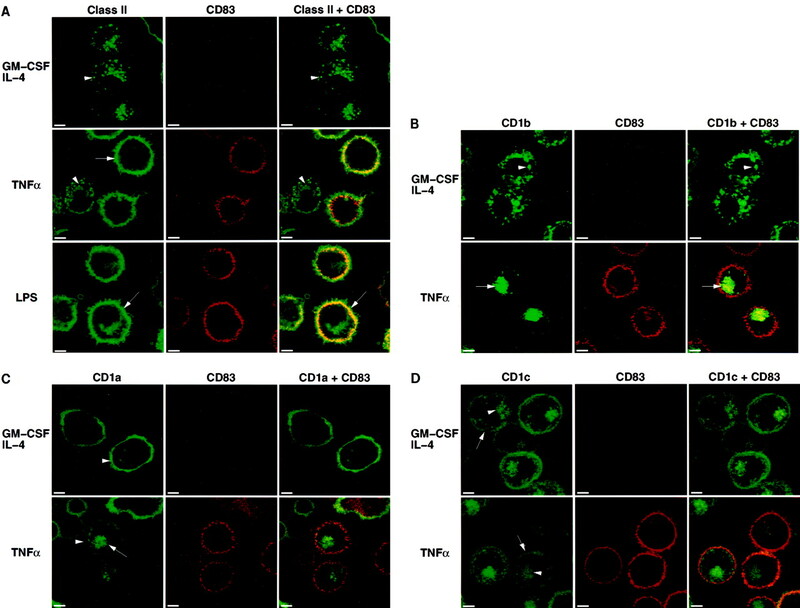 To address this hypothesis, the ability of immature DCs to present endocytosed protein and lipid Ags to specific T cells was evaluated in the presence or the absence of TNF-α. Peripheral blood monocytes were differentiated into immature DCs by a 3-day incubation with GM-CSF and IL-4. Following complete removal of a small fraction (1–10%) of contaminating CD83+ mature DCs using anti-CD83 Ab and magnetic beads, the remaining CD83− immature DCs were pulsed for 10 min with various concentrations of either TT or GMM, and then washed extensively to remove free Ags. Subsequently, the Ag-pulsed DCs were incubated for 24 h in the presence or the absence of TNF-α stimulation. At the end of the culture the TT- and GMM-pulsed DCs were fixed with glutaraldehyde, and their ability to stimulate the TT-specific, HLA-DR-restricted T cell line (SPF3) and the GMM-specific, CD1b-restricted T cell line (LDN5), respectively, was assessed by measuring [3H]thymidine uptake by the T cells. When TT-pulsed immature DCs were stimulated with TNF-α to undergo maturation, they activated the SPF3 T cells more efficiently (by ∼2- to 3-fold at every Ag concentration tested) compared with those DCs cultured without TNF-α (Fig. 6⇓, upper panel). In contrast, little effect of TNF-α stimulation was detected on CD1b-mediated presentation of GMM to the LDN5 cells (Fig. 6⇓, lower panel). Thus, unlike MHC class II that required DC maturation to mediate efficient protein Ag presentation, CD1b-mediated presentation of lipid Ags functioned independently of DC maturation. The effect of DC maturation on Ag presentation by MHC class II and CD1b molecules. Immature DCs were pulsed with either TT or GMM for 10 min at 37°C and then washed. These Ag-pulsed DCs were incubated for 24 h in the presence of GM-CSF and IL-4 either with (•) or without (▪) TNF-α. The cells were then fixed with glutaraldehyde and incubated with the TT-specific, DR-restricted T cell line (SPF3) or the GMM-specific, CD1b-restricted T cell line (LDN5). T cell proliferation was assessed by measuring [3H]thymidine incorporation during the last 6 h of culture. DCs exhibit a remarkable ability to mediate both MHC-dependent and CD1-dependent pathways of Ag presentation. Formation of Ag-bound MHC class II molecules in lysosomes and their subsequent delivery to the plasma membrane are a series of tightly regulated processes associated with DC maturation. However, it remains elusive how DC maturation affects CD1-dependent presentation of lipid Ags. In the present study we showed that in contrast to the striking increase in surface expression of MHC class II after DC maturation, the cell surface expression of CD1 molecules was either increased only modestly (for CD1b and CD1c) or actually decreased (for CD1a; Fig. 1⇑). Although immature DCs maintained a large lysosomal pool of both MHC class II and CD1b molecules, lysosomes of mature DCs were almost devoid of MHC class II, but still contained a large fraction of the CD1b molecules, suggesting a much more pronounced net transport from lysosomes to the plasma membrane for MHC class II than for CD1b during DC maturation (Figs. 4⇑ and 5⇑). Immature DCs are highly phagocytic (Fig. 2⇑) and appear to efficiently endocytose both protein and lipid Ags of foreign origin. However, MHC class II-mediated presentation of protein Ags, but not CD1b-mediated presentation of lipid Ags, depended substantially on DC maturation (Fig. 6⇑). Taken together, these data underscored the distinct regulation of MHC and CD1 function during DC maturation. The ability of immature DCs to efficiently mediate CD1-dependent lipid Ag presentation even in the absence of maturational stimuli may be of physiological importance. During microbial infection, immature DCs sample microbe-derived protein Ags, but are unable to present them to T cells until they undergo substantial maturation. To initiate maturation, immature DCs use their Toll-like receptors and detect microbial components, such as LPS from Gram-negative bacilli, lipoteichoic acids from Gram-positive bacilli, and lipoarabinomannan from mycobacteria (36, 37). Once activated by proper stimuli, protein Ag-loaded DCs undergo maturation while migrating into draining lymph nodes, where fully matured DCs efficiently activate peptide Ag-specific naive T cells in a CD28-dependent manner (1, 38). Although this type of acquired immunity is essential for adaptive, peptide Ag-specific T cell responses against microbes, it takes days to occur. In contrast, the results obtained in the present study indicate that presentation of microbial lipids does not require maturation of DCs. The ability of immature DCs to present lipid Ags without maturational stimuli may provide a valuable opportunity for the immune system to mediate prompt CD1-specific T cell responses, even before peptide Ag-specific T cells are fully differentiated and expand. It should be noted that virtually all microbial lipid Ag-specific, CD1-restricted T cells analyzed to date lack the expression of CD28 (27), and thus, unlike most peptide Ag-specific T cells, activation of lipid Ag-specific T cells does not appear to require interaction with costimulatory ligands, such as CD80 and CD86, that are expressed at high levels on DCs only after maturation. DC maturation-associated reorganization of lysosomes has been noted previously in a murine DC line and may account for efficient transport of MHC class II molecules from lysosomes to the plasma membrane during DC maturation (39). In human monocyte-derived DCs analyzed in the present study we also observed that lysosomes are deprived of MHC class II after maturation and loose their tightly packed membranes (Fig. 5⇑). In contrast to MHC class II, a large pool of CD1b molecules appeared to be maintained in lamp-1+ lysosomes throughout DC maturation, and no evidence for the net transport of CD1b from lysosomes to the plasma membrane was noted (Figs. 4⇑ and 5⇑). Delivery of lipid Ag-bound CD1b molecules from lysosomes to the plasma membrane must occur in both Ag-pulsed immature and mature DCs, as suggested by functional experiments (Fig. 6⇑). Three pathways of delivery from lysosomes to the plasma membrane have been described. Tubulation and vesicle formation of the lysosome were proposed to account for delivery of MHC class II molecules to the plasma membrane during DC maturation (39). Previously, a specialized CIIV vesicle was identified in murine DC and was also proposed as a delivery route for MHC class II during DC maturation (7). For CD1-based Ag presentation, however, it is also necessary to account for the ability of immature DCs to deliver Ag-loaded complexes from lysosomes to the plasma membrane. One potential mechanism that may account for this is the exosome-dependent pathway previously noted to occur in murine immature and mature DCs as well as in human B cells (40, 41). In this pathway the limiting membrane of lysosomes fuses with the plasma membrane, resulting in delivery of the limiting membrane-bound proteins to the plasma membrane while exocytosing the inner membranes. Consistent with this possibility, it should be noted that a majority of CD1b molecules reside on the limiting membrane of lysosomes, whereas most MHC class II molecules are detected on the inner membranes (13). Once DC maturation has occurred, both molecules may reach the plasma membrane during the unraveling of lysosomes that occurs during DC maturation, but CD1b may continue to recycle and be delivered back to the clustered, postmaturation lysosomes, while MHC class II remains on the cell surface with a prolonged half-life (8). The current data cannot distinguish the relative contributions of differences in transport from lysosomes to the cell surface vs differences in rates of internalization from the plasma membrane and delivery back to lysosomes as the major pathway that accounts for the profound differences in steady state localization of CD1b and MHC class II after DC maturation. Although both MHC and CD1 molecules mediate Ag-specific T cell responses of acquired immunity, recent studies suggest that CD1d molecules (42) and CD1a, -b, and -c molecules (43, 44) (M. Vincent, D. Leslie, and M. B. Brenner, unpublished observations) have the capacity for foreign Ag-independent T cell recognition that suggests a role for some CD1-reactive T cells at early points in the immune response. This type of self-reactive, CD1-specific recognition may provide an interface between innate and acquired immunities. The functional experiments presented here that reveal the distinct regulation of MHC and CD1 during DC maturation provide further support for the possibility that CD- restricted, foreign Ag recognition by T cells may occur early in immunological responses even before MHC class II molecules are fully functional. We thank Drs. M. Fukuda, D. B. Moody, D. Olive, and C. Mawas for their gifts of reagents. ↵1 This work was supported by grants from the National Institutes of Health (to M.B.B. ), Netherlands Leprosy Relief (ILEP 702.02.20), and NBO National Institutes of Health (Grant R31-AI28973 to P.P. and N.v.d.W.). M.S. and X.C. were supported by the Leukemia and Lymphoma Society. ↵3 Abbreviations used in this paper: DC, dendritic cell; GMM, glucose monomycolate; MFI, mean fluorescence intensity; MIIC, MHC class II compartment; lamp-1, lysosome-associated membrane protein-1; TT, tetanus toxoid.